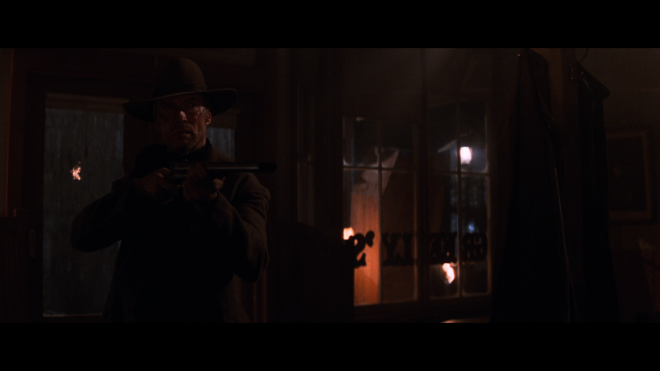 The passage of time continues to confirm the landmark achievement of Unforgiven, quite possibly a great director's finest film. Winner of 4 Academy Awards including Best Picture, Director (Clint Eastwood), Supporting Actor (Gene Hackman) and Editing (Joel Cox), Unforgiven stars Eastwood and Morgan Freeman as retired outlaws who pick up their gun one last time to collect a bounty. Richard Harris is an ill-fated killer-for-hire, Hackman is a sly lawman of chilling brutality, and "Unforgiven is a classic Western for the ages" (Todd McCarthy, Variety). Portions of this review also appear in our coverage of the standard Blu-ray release written by Peter Bracke. Specifically, Mr. Bracke penned the "Movie" section while M. Enois Duarte wrote new Vital Disc Stats, Video, Audio and Final Thoughts sections, and David Krauss wrote the Supplements. As a kid growing up in the '70s, I would say that the western was probably my least favorite genre (well, aside from musicals, but that's a subject for a different review). I can remember my grandfather obsessively watching old reruns of Bonanza, Maverick and The Lone Ranger every night on our little B&W tee-vee, and me just not getting it. I loved horror and sci-fi and drama, and wanted something that wasn't about "old people" -- why should I care about Lorne Greene in a cowboy hat, shooting at Indians? And that's the attitude I clung to up and through the '90s wave of "revisionist" westerns, led by such blockbusters as Dances with Wolves and Clint Eastwood's Unforgiven. Even after both films took home the Oscar for Best Picture in their respective year of release, I still refused to give in. It was only when I stumbled by chance upon an airing of Unforgiven on cable a few years later, on one of those lazy Sunday afternoons when you have no energy to even change the channel, that I reluctantly gave it a try. And to my great surprise, there I ended up sitting transfixed for the film's entire 131-minute runtime. I suppose the biggest compliment I can pay 'Unforgiven' is that even for a western-hater like myself, it was the first film I ever saw that finally gave me if not a passion for the genre, then at least a genuine sense of respect. 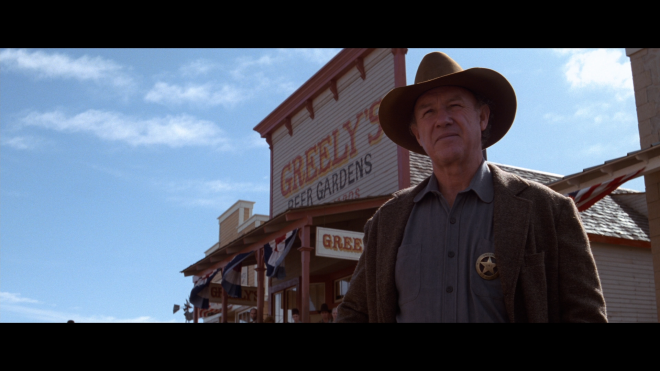 Unforgiven is classified as "revisionist" (though technically it should be "post-revisionist," as 1967-1978 saw the first wave of revisionist westerns, but nevermind) because it challenges and subverts all of the cliches and conventions we've come to expect of the genre. Gone or severely undermined are the hallmarks of westerns past -- black and white heroes and villains, gunfights at high noon, the steadfast women who stand by the sides of their men, and the relentless racial stereotyping. The Old West of Unforgiven is untamed and morally ambiguous, with characters of conflicting and complex motives, who kill not out of righteousness but for money, revenge or just plain indifference. Eastwood's Bill Munny, the protagonist of Unforgiven, is a far cry from The Lone Ranger. A hired assassin, a remorseless killer, a dedicated family man, he hung up his gun a long time ago, but with his wife now dead and his kids nearly grown, he agrees to one last job. Hired by the madam of a local brother (Frances Fisher) looking to avenge the maiming of one of her prostitutes, Munny accepts the job not of moral obligation or a quest for justice, but for profit. 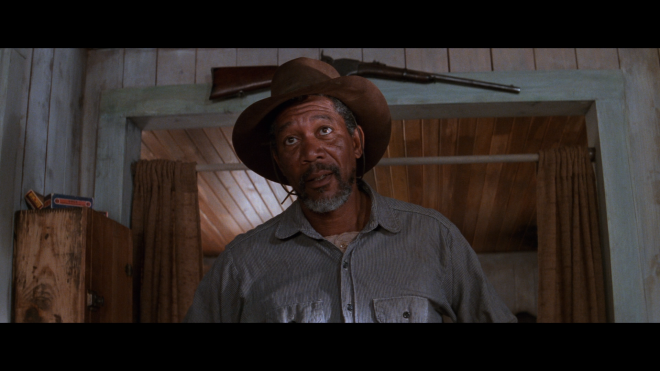 He teams up with his loyal partner Ned Logan (Morgan Freeman) as well as "The Schofield Kid" (Jaimz Woolvert), an all-too-eager would-be killer whose talk is much bigger than the size of his gun. But none of the trio is counting on Sheriff "Little" Bill Daggett, who is so bloodthirsty and amoral he will render the line between right and wrong indistinguishable. By the film's climax, what was supposed to be a simple "hit" will turn into a violent tragedy of mythic proportions. 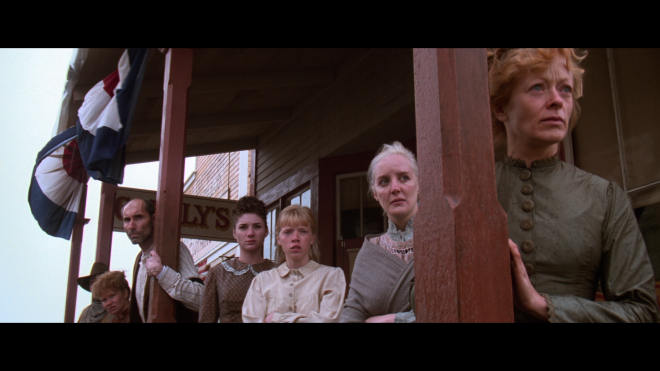 I like Unforgiven because it shatters all of the most beloved conventions of the western. In fact, you could argue it desecrates them with relish, however respectful. 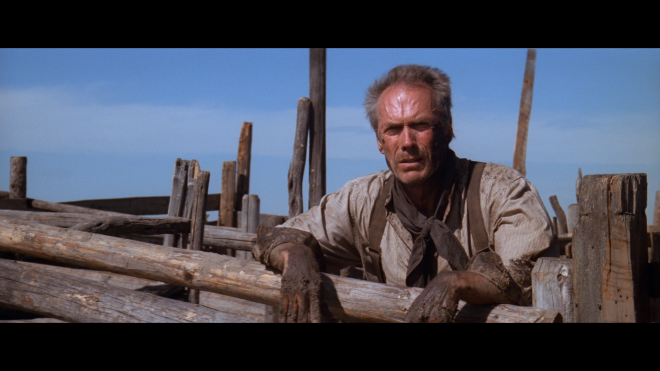 Eastwood is nothing if not an elegant cinematic anarchist. His vision of America's lawless past is not painted in the broad strokes of cherished populism and unfettered patriotism. Instead, it is an ugly, messy place, where justice can only be accomplished with a gun and morality is a relative term. By the time of the film's climactic bloodbath, Eastwood has managed to turn the film's slow burn into an explosion of such fury it practically rewrites cinematic history with one single parting image. Bill Munny may ride off into the night like every other western "hero" before him, but the legacy he leaves remains unduplicated in history of the genre. 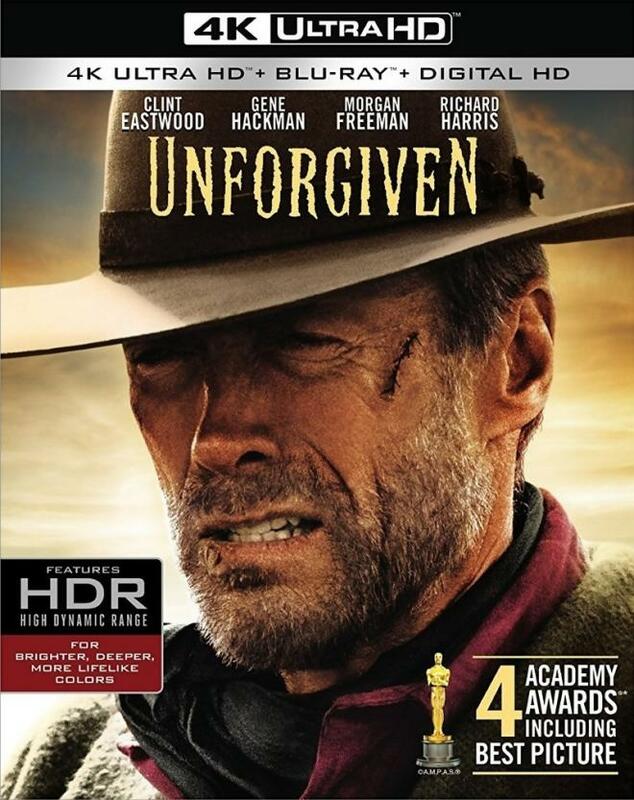 To celebrate the film's 25th Anniversary, Warner Home Video brings 'Unforgiven' to Ultra HD Blu-ray on a two-disc combo pack with a code for an UltraViolet Digital Copy. The dual-layered UHD66 disc sits comfortably opposite a Region Free, BD50 disc, and both are housed inside a black, eco-cutout case. At startup, viewers are taken to a generic static screen with options and music. The now classic western revision rides into the Ultra HD town packing a beautiful and often stunning HEVC H.265 encode, making it the best the film has ever looked and the new preferred way of watching it. Reportedly, Warner Bros remastered the original elements for this 25th Anniversary release, but without any official confirmation, back to back comparisons between the UHD, accompanying Blu-ray and previous editions reveals the studio might actually have created a new 4K master. But in either case, the 2160p video is noticeably sharper than its Blu-ray counterparts. Of course, there are a few softer, poorly-resolved moments sprinkled throughout, many of which are seen during low-lit interiors and very likely related to the original photography. Nevertheless, viewers can better make out the tiniest stitch, wrinkle and the fabric of the costumes while hairs both in the cast and animals are incredibly detailed. Facial complexions appear natural with lifelike textures, and occasionally, the most trifling blemish and grain in the wood is plain to see. Presented in a 2.40:1 aspect ratio, Jack N. Green's cinematography benefits the most from the upgrade, showing a comfortably brighter contrast that allows for better visibility into the far distance. On the whole, the picture is still fairly balanced and restrained to fit the mood of the subject matter, but the sunshine in daylight exteriors feels more intense and hot. The fluffy clouds in the sky are more distinct and differentiated from one another while glowing a brilliant white. Specular highlights give the metal of guns, buckles and the round edges of locomotive engines a realistic shimmer, and the sun shines against the foreheads of the cast while still exposing pores. Black levels don't improve as much as I would've liked, but they remain true and accurate with deep, penetrating shadows that don't overwhelm the finer details. On a side note, however, nighttime interiors are noticeably darker and much gloomier than before. Most surprising perhaps is a wider, more vivid palette, providing the panoramic evening shots with a gorgeous array of colors. The now signature shot of the Munny homestead with the tree and gravestone comes with a deep, fiery orange and a fascinating golden red hue. Others are a majestic spectacle of purple and magenta fading into a dark blue sky as the sun sinks into the horizon. Flesh tones, too, appear more authentic and faithful to the climate. Of course, much of the photography leans towards natural earth tones, such as dusty browns and the warm yellow glow of lamplights, adding a great deal of authenticity to the story. But primaries remain full-bodied and richly saturated. With a thin, natural grain structure washing over every scene, the 4K presentation is simply beautiful and a nice improvement over its predecessors. Tempting fans to upgrade their previous Blu-ray releases is a brand-new DTS-HD Master Audio 5.1 soundtrack, which is simply phenomenal and absolutely the best part of the whole package. This is what we've been waiting for, and boy, it does not disappoint, as surrounds are continuously kept busy with noise of wildlife. Birds, crickets and other random critters are heard all around for almost the entirety of the runtime, making the listener feel as though actually sitting in the middle of farmlands. The town of Big Whiskey feels more like a bustling city with the endless commotion and clatter of residents employing every speaker while the natural sounds of wind blowing and the heavy downpour of rain fill in quieter moments, creating an awesomely immersive 360° soundfield that's simply fantastic. Much of this activity lends itself well to the receiver's DSU processing, allowing many of those same effects to travel discreetly into the overheads without feeling forced or strained. A majority of the action remains spread out across the front soundstage, only with far better clarity and balance among the three channels and light bleeding into the top heights. Background activity pans from one side of the screen to the other with incredible, convincing ease, generating a welcomed and spacious soundscape. The mid-range is also a bit more dynamic with better warmth and richer fidelity where the listener can appreciate a crisp, clear distinction between the quietest moments and the sudden bursts of high-pitched gunfire. Dialogue reproduction is clearer, more precise and surprisingly more intelligible, giving each conversation and exchange a deeper, more emotional impact. The only complaint worth noting is a somewhat disappointing low-end, but nevertheless, gunshot come with a bit weight, making this lossless mix the best and most impressive improvement of the whole UHD presentation. The same set of supplements are ported over from the previous Blu-ray editions, and the commentary track can also be enjoyed on the Ultra HD disc. This is what David Krauss had to say in his review of the 2012 digibook edition, which can be read here. Audio Commentary: Film critic and Eastwood biographer Richard Schickel sits down for a scene-specific audio commentary. Of course, it is disappointing not to have Eastwood on the track -- or anyone involved in the making of the film, for that matter -- but Eastwood just doesn't do commentaries, so there you have it. However, Eastwood and Schickel have maintained a friendship for many years, so Schickel certainly knows his subject. But more than just being articulate and knowledgeable about Eastwood's filmmaking aesthetic, Schickel also spent a considerable amount of time on the set of 'Unforgiven,' and does offer some significant perspective on Eastwood's thematic sensibilities and stylistic technique during the production. Still, while this track is certainly noteworthy in terms of its critical analysis of Eastwood's work, and thus should be of interest to Eastwood historians, I suspect the average fan will likely take a pass. Eastwood on Eastwood (SD, 108 min): Produced and directed by Schickel, this made-for-cable documentary is a generally terrific, perceptive visual history of Eastwood's illustrious career. Schickel flouts typical practice by dropping the usual cavalcade of cast and crew interviews, opting instead for a one-on-one with Eastwood. John Cusack narrates, and by interspersing plenty of film clips and production footage, Schickel is better able to illustrate the themes and relevance of Eastwood's body of work to modern cinema than on the much-longer commentary track. "Eastwood on Eastwood" still feels a bit academic at times -- and certainly is far from focused on 'Unforgiven' -- but it is still a great watch, even for casual fans of the filmmaker. All on Accounta Pullin' a Trigger (SD, 21 min): This 2002 featurette includes then-new interviews with Eastwood, Freeman, and Hackman, among others, but it's just not long enough to go beneath the surface. It is also far too reliant on film clips, which gives it the feel of a fluff piece. Eastwood & Co.: Making Unforgiven (SD, 24 min): The film's original 1992 featurette is actually better at documenting the making of the movie than its 2002 counterpart, as it contains more behind-the-scenes footage and better investigates Eastwood's vision for the film. Eastwood...A Star (SD, 16 min): Last and least is this very odd featurette, which plays more like an infomercial. Complete with goofy narration, this career retrospective makes it sound as if they're selling Clint by the pound. I thought it was hilarious. Vintage TV Episode (SD, 49 min): Here we have the disc's only total throwaway, an early Clint appearance as a cowboy on the classic TV series, 'Maverick' [an episode entitled "Duel at Sundown"]. It doesn't really have anything to do with 'Unforgiven' (aside from the fact that it's a television property owned by Warner), but it's still a hoot to watch. It's presented here in 4:3 pillarboxed video and encoded at 480i. By far among the best of the '90s "revisionist westerns," 'Unforgiven' also stands tall in the Clint Eastwood oeuvre as one of his most accomplished, refined and assured works -- and that is saying a great deal. It may have marked the beginning of the twilight years of Eastwood's long and distinguished acting career, but however cheesy it sounds to say, 'Unforgiven' has truly aged like a fine wine in the past fifteen years. Riding into the rough and rowdy town of Ultra HD Blu-ray, the now classic western arrives with a beautiful and often stunning 4K presentation, making it the best the film has ever looked. As an added bonus, fans are finally treated to a fantastic, reference-quality DTS-HD soundtrack that fans will absolutely love. 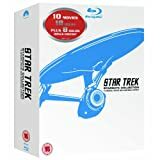 Although the same set of supplements are ported over from previous Blu-ray editions, the overall package is an excellent upgrade over its HD counterpart.